The University of Maryland (UMD) student chapter of the Electrochemical Society (ECS) organized tours for student members during the 224th meeting of the ECS. 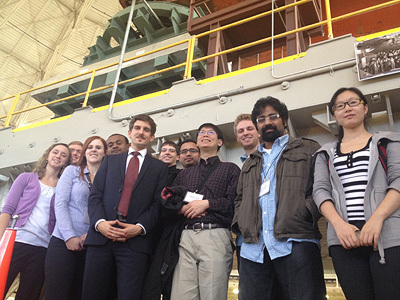 The group visited Lawrence Berkeley National Lab’s (LBL) Advanced Light Source (ALS) and the PolyPlus Battery Company. UMD ECS chapter president and Department of Materials Science and Engineering (MSE) graduate student Colin Gore arranged the event. ECS chapter members William Gibbons (Department of Chemical and Biomolecular Engineering), Ying Liu (Department of Mechanical Engineering), and Thomas Winkler (Institute for Systems Research) joined Gore on the tours. Students from the University of Virginia and Colorado School of Mines chapters also participated. The ECS tour group poses under a massive electromagnet from the retired cyclotron at Advanced Light Source, mimicking a photograph (top right) of Lawrence and Lab scientists from over half a century ago. Photo courtesy of Colin Gore. ALS lab manager Doug Taube led the group through the facility, which had reopened only days earlier following the government shutdown. He began by chronicling the history of the lab and its founder, Nobel Laureate Earnest Lawrence, who invented the cyclotron in the 1930s. He also described the eventual repurposing of the facility as a synchrotron source–currently the brightest soft x-ray source in the U.S.–in the 1980s after its cyclotrons were decommissioned. The group was then guided around the synchrotron and its 43 beamlines. Taube highlighted some of the breakthrough research being conducted at several of the end stations, including surface science of advanced fuel cells at ambient pressure and 3D tomography of the xylem in drought-tolerant grape vines. Following the ALS tour, the group visited the offices of the PolyPlus Battery Company, where CEO/CTO and former ECS Division Chair Dr. Steven J. Visco arranged for a demonstration of his company’s award-winning technology. PolyPlus specializes in new primary and rechargeable lithium-air, lithium-water, and lithium-sulfur batteries and battery components. New Business Development officer Thomas Conry described PolyPlus’ unique “protected Li electrode” technology and its implementation in each of their devices.